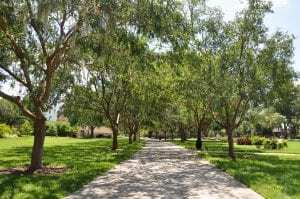 UCF has been a celebrated Tree Campus USA, a program run by the Arbor Day Foundation, since 2011. This program supports campuses across the country that effectively manage their campus trees, develop connectivity with the community to promote healthy urban forests, and that strive to engage their student population through outreach and volunteer opportunities. In maintaining our Tree Campus USA title, Landscape and Natural Resources has implemented a Tree Care Plan and has a Tree Team on staff which includes 2 certified arborists, a plant pathologist, and a chainsaw specialist educated in proper tree pruning methods. Our tree team takes pride in caring for our trees and implement different strategies for improving tree health across campus. If you are interested in learning about tree care on campus, take a look at our Urban Forestry page. LNR is working toward a more diverse and appropriate tree canopy on campus, with a preponderance of native trees and understory plantings. Native plantings create a favorable canopy, while reducing irrigation needs. Since March 2011, over 100 dead or diseased trees were removed and 25 trees were air spaded to improve root vigor and plant health. 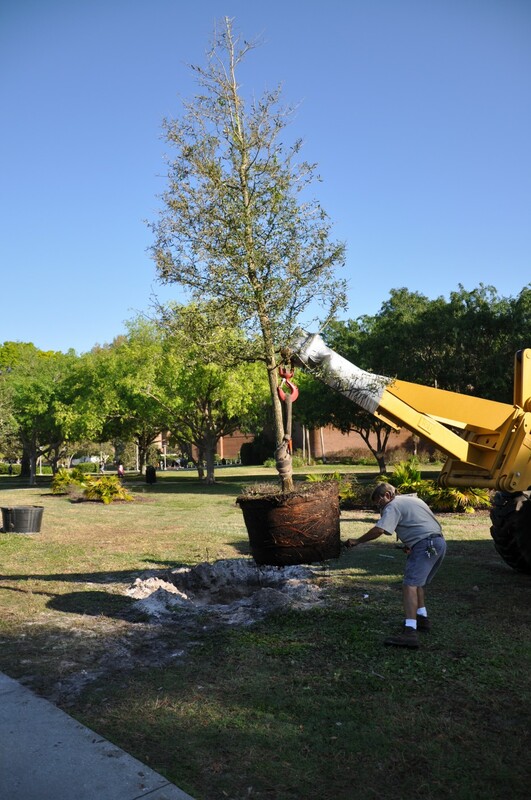 This past year (2013), 240 trees and palms were planted across campus, 603 hardwood trees were pruned, and 112 palms were pruned by our team of arborists. An evaluation of UCF’s tree campus, using the methodology created by Urban Forestry Effects (UFORE) model, was completed by LNR students. Results of this study found that UCF’s tree canopy covers approximately 58.82% of the total campus area, and is composed of mostly (91.26%) trees native to North America. Carbon emissions sequestered from the canopy were estimated to be 4,955 metric tons, which is equivalent to 555,498 gallons of gasoline, or 972 passenger cars annually. The total amount of pollutants reduced by the urban forest was estimated at 16,284 kg/yr of which, 73% are attributable to trees and 27% to shrubs. Primary pollutants removed are ozone and particulate matter, which contribute to respiratory illness.